I saw a lot of other good things at the farmer’s market today too like sugar snap peas, blackberries (they were in a plastic clamshell container though so I didn’t get them), peaches, nectarines, cabbages and summer squash. If you haven’t tried going to a farmer’s market, I highly recommend it! Farmer’s markets don’t have very much plastic packaging and the food is really fresh. You’ll be able to taste the difference. An added plus is that buying from local farmers supports your local economy. 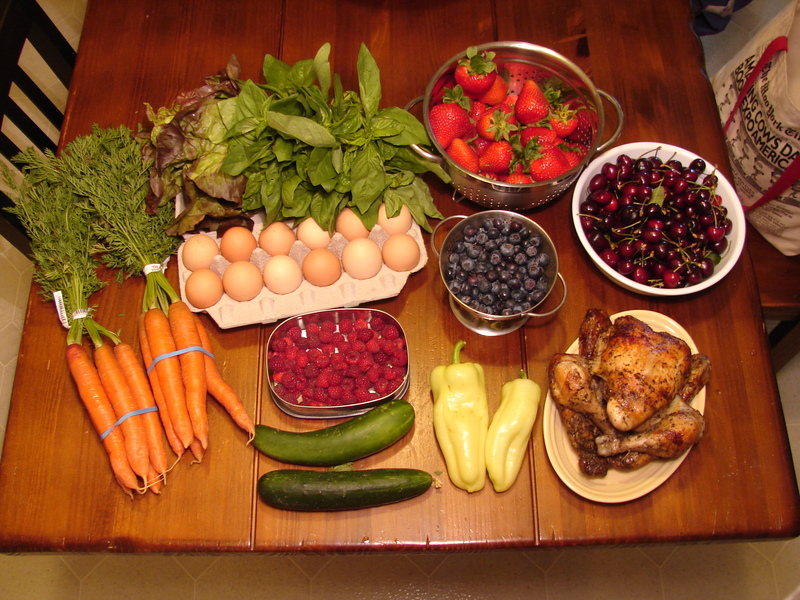 Signing up for a CSA box is another good way to get fresh, local produce. You can find a CSA to sign up for here and you can find a farmer’s market here. I am not familiar with Lunchbots, but it looks like the top is plastic. If you recommend it, it obviously isn’t. So how does the top “attach” or seal so there are no spills? The website didn’t address this. The tops aren’t plastic. The tops are metal and they snap on. They aren’t leak-proof though. They do have some leak-proof thermal ones, but the outer lids are plastic. Thanks for the link to lunchbots. I am looking for a new lunch box solution.